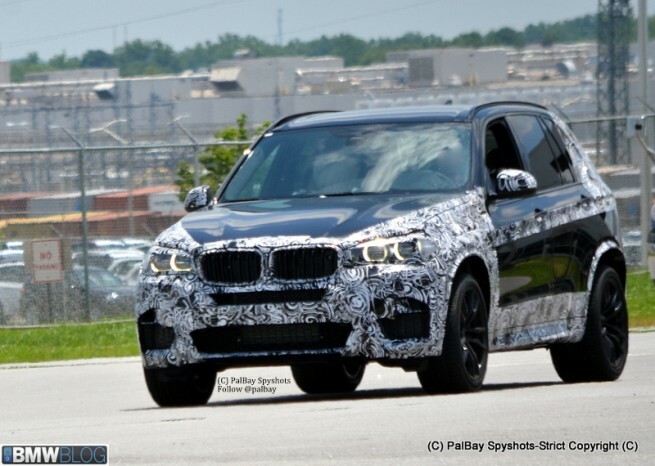 Spy photos of the 2014 BMW X5M emerge from South Carolina. Spy photographer Palbay spotted an F15 X5M test mule that goes on sale next year. The prototype sports very little camouflage that aims to hide some of the expected M design cues: large air intakes, wider bodykit, rear diffuser and blue calipers M brakes. At the rear end, the F15 X5M features the typical quad exhaust pipes. The test mule spied also comes with the LED headlights that now flow into the 3D kidney grille. Under the hood we expect to see the same S63Tu engine from current generation but with a power increase similar to the Competition Package on the M5 and M6, translating to 575 horsepower. Since the F15 X5 is slightly lighter than the previous generation, we expect the new X5M to shed some weight as well which should improve its current 0 to 60 time of 4.1 seconds. Here is a complete photo gallery.